This colourful dish packed full of nutrition and health is the perfect light dinner to unwind to! It is incredibly quick and easy to whip up as well! STIR FRY BONUS! There is no better way than a stir fry to use up as any odds and ends of food that you have in the fridge. A stir fry is also an opportunity to make a delicious dish that incorporates every colour of the rainbow! Try to combine as many colourful vegetables as possible for a nutritious and scrumptious meal, since different coloured vegetables have different health benefits to offer, so indulge in all that you can find! This recipe can EASILY BE MADE VEGAN BY NOT INCLUDING THE CHEESE. 1. Put the oil in the pan and first add the spinach and peppers so that they can cook and so that the spinach wilts down. 2. 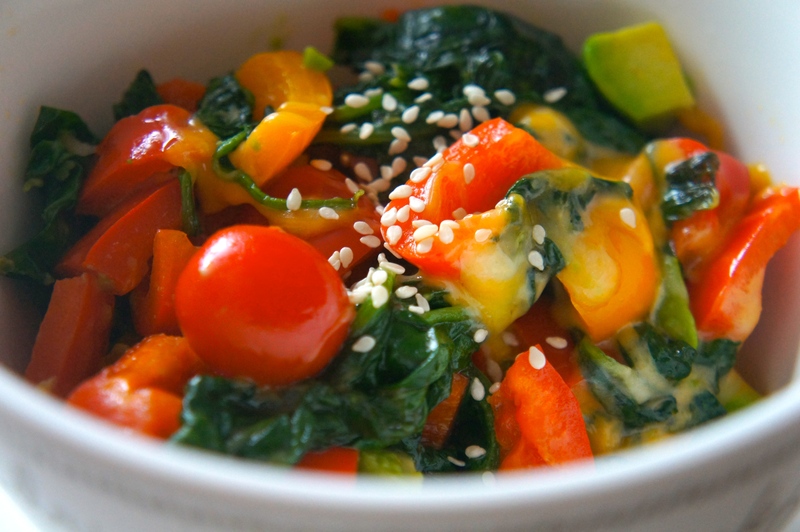 Once the spinach has wilted and the peppers are almost cooked add the tomatoes, sesame seeds and cheese. 3. Once the cheese is melted then toss in the avocado. After about 3 minutes once it a big cheesy colourful combination of deliciousness take off stove top and put into a bowl. Dig in!